Third exilarch of the Arabian period; died in 730. He was a descendant of Bostanai I. and a successor of Ḥanina b. Adai. His eldest son was Solomon b. Ḥasdai, who also, after his father's death, became exilarch. His second son, David, was the father of Anan ben David, the founder of the Karaites, and, according to Karaite tradition, was gaon. 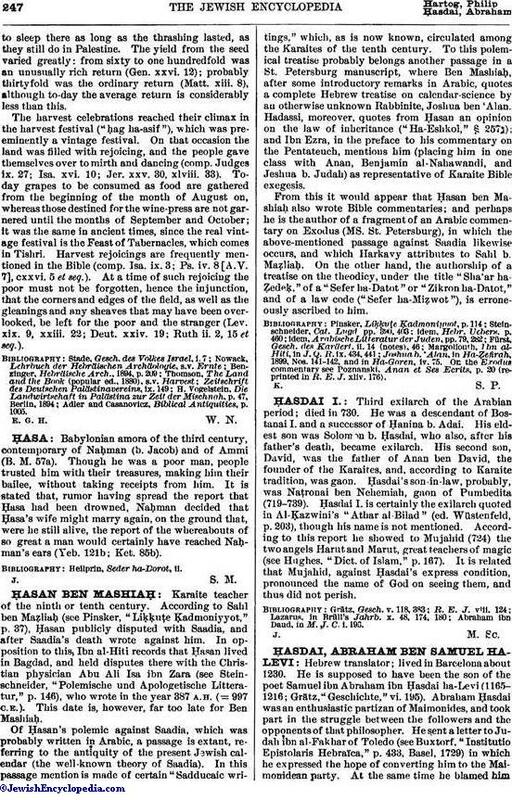 Ḥasdai's son-in-law, probably, was Naṭronai ben Nehemiah, gaon of Pumbedita (719-739). Ḥasdai I. is certainly the exilarch quoted in Al-Ḳazwini's "Athar al-Bilad" (ed. Wüstenfeld, p.203), though his name is not mentioned. According to this report he showed to Mujahid (724) the two angels Harut and Marut, great teachers of magic (see Hughes, "Dict. of Islam," p. 167). It is related that Mujahid, against Ḥasdai's express condition, pronounced the name of God on seeing them, and thus did not perish. Abraham ibn Daud, in M. J. C. i. 190.